Cashflow was perhaps the biggest of several success stories in ScS half-year results, which were released this morning. Suppliers of a Dewsbury headboard maker whose goods are sold via platforms such as Amazon face a shortfall of nearly half a million pounds after the company was placed into liquidation. Ecommerce group Buy It Direct has acquired the IP, stock and certain assets of BetterBathrooms, the circa £60 million turnover retailer that entered administration earlier this month. Markus Jooste, the former chief executive of Steinhoff International Holdings, is yet to speak with PwC, which has been investigating alleged accounting irregularities that were first noted on the day he resigned back in late 2017. PwC has delivered its report into accounting irregularities to Steinhoff. A small group of unspecified former Steinhoff International Holdings executives conspired to inflate profits or asset values over a nine-year period between 2009–2017, according to a report by PwC. Timing is everything when it comes to examining performance in the seasonally-affected furniture sector. DFS plans to turn Sofology into a £300m business. DFS, Britain's biggest sofa retailer and one of its largest manufacturers, is to leverage its vertical supply chain by producing upholstery for the Sofology chain it bought back in 2017 for the first time. 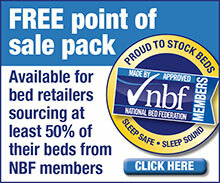 Beds specialist Dreams added to the National Bed Federation award it won last autumn by last night being named the country's leading Speciality Retailer. Maisons du Monde cashflow weakened as it invested in stock. International furniture and home accents retailer Maisons du Monde, which has substantial eight-figure UK sales, says it can grow another 10 percent this year as it builds out its store estate. The Closing the Gap conference takes place Friday, April 26, 2019 at Furniture Makers' Hall, London. A new solution to help the furniture industry close the skills gap is to be presented by The Furniture and Interiors Education, Skills and Training Alliance (Fiesta) next month. Yorkshire insolvency outfit appointed Kingstown Furniture administrators. The Kingstown Furniture group, one of the UK's largest remaining volume cabinet makers, has been placed into administration and ceased production. The business is to be wound down. The new Warrens Evans website. Warren Evans, the southeast England beds brand that went under in February last year, is back, this time as an online retailer with no showrooms. John Lewis & Partners' return to home sales growth was short-lived as it posted a double-digit decline across the broad-brush category in the seven days to March 9. AHF has a new head of ecommerce. AHF, the furniture retail chain that was last year bought by Airsprung owner Andrew Perloff, has appointed experienced online retail executive Alex Broughton as its new head of ecommerce. Lorraine Kelly stars in new adverts with her border terrier, Angus. Ecommerce home furnishings retailer Wayfair has launched its new UK television advertising campaign featuring ITV host and brand ambassador Lorraine Kelly. All change: (l–r) Eve Sleep chief brand officer Kuba Wieczorek is going part-time; CEO Jas Bagniewski left last year, CFO Abid Ismail is leaving, while COO Felix Lobkowicz has also left. Chief financial officer Abid Ismail and chief operating officer Felix Lobkowicz are to leave Eve Sleep as the broom sweeping through the direct-to-consumer mattress company delivers more change. The departures were announced alongside 2018 results. Profits advanced at Julian Bowen, one of Britain's largest furniture importers and wholesalers, after overhead management helped counter the impact of lower revenue. The eponymous founder of South East beds business Warren Evans, which ceased trading in February last year, will today relaunch the brand as an ecommerce pureplay. Direct-to-consumer mattress business Eve Sleep says its products will no longer be sold in Dreams stores or online after the two companies agreed to end the partnership. Footfall dipped across all three principal types of physical retail destination in February though retail parks, home to many comparison goods retailers selling furniture and flooring, saw the shallowest declines. Optimism among UK furniture makers is scarce despite a welcome reduction in cost pressures, according to new research by trade body BFM, the association for British Furniture Manufacturers. Eve Sleep shares fell to a new low on Friday. It is nearly two years since direct-to-consumer mattress and ancillary sleep products company Eve Sleep successfully raised £35 million in an IPO that valued the company at about £140 million. London Fabric took place Mar. 4–5, 2019. BFM, the lead trade association for British furniture makers, says its two-day London Fabric exhibition covered all bases this week with it getting praise from both exhibitors and visitors. Mimosa medium sofa, part of the new Orla Kiely upholstered furniture collection being launched at Barker and Stonehouse. Inset: Orla Kiely. Privately-owned retailer Barker and Stonehouse is launching the first-ever upholstered furniture collection from Orla Kiely after agreeing an exclusive partnership with the renowned print designer. Department store chain John Lewis & Partners will overhaul its furniture offer in the next year after saying its best performing product categories in the past 12 months were those where it had invested the most. Sports Direct is a major shareholder in Debenhams. Sports Direct International will try and oust all bar one of Debenhams' directors and install its chief executive Mike Ashley to the department store chain's board under incendiary plans to seize management control. Designer kitchenware business Joseph Joseph enjoyed double-digit sales growth in 2017–18 after a spike in demand for its trendy products in overseas markets. Though margins narrowed, the company still cleared 14 percent net. Wayfair customers in parts of Scotland and Northern Ireland will no longer have to pay to have furniture delivered after the fast-expanding ecommerce retailer extended its free delivery service to all parts of the UK. Belgian foam conglomerate Recticel grappled weaker demand in the upholstery and bedding sectors in 2018 but its non-furniture related business insulated its bottom line. Clare Taylor has joined Breasley Group as head of marketing. East Midlands mattress maker and foam converter Breasley Group has appointed Clare Taylor as head of marketing, saying the creation of the new role was sparked by its fast expansion. Monoqi.co.uk is the retailer's dedicated UK ecommerce asset. Investors have snapped up the assets of Monoqi, the European furniture etailer that operates a dedicated UK sales channel and which bought selected parts of MyDeco four years ago. Home merchandise returned to growth at John Lewis & Partners last week with the department store chain benefiting from better weather compared to the same period last year. Former Aspinal, Mulberry and LVMH director Lisa Montague has been appointed CEO at luxury furnishings group Walker Greenbank. The post had been vacant since John Sachs' departure last autumn. As we reported February 22, House of Fraser is heading to Ireland for the first time. It will also open five other new concessions inside the department store chain nationwide. Image: HoF. Upholstery vertical Sofa.com will take the number of concessions inside House of Fraser stores to 14 with the addition of a further six spaces in the weeks ahead. SCP, the modern furniture maker and retailer founded by Sheridan Coakley back in 1985, is expanding with the opening of a second London retail store. Findel, the circa £500 million turnover home shopping business, could become the latest addition to Mike Ashley's retail empire after Sports Direct International said it was bidding for the Manchester based company. Uncertainty hit spending in February according to the BRC. Britain's leading retail membership group has delivered a bearish assessment of February trade, claiming furniture sales suffered amid uncertainty surrounding Brexit. Top line growth returns for North West decorative lighting supplier. Lee Longlands returned to profit in 2017–18. Furniture retailer Lee Longlands generated cash and returned to profit in 2017–18 ahead of moves to reconfigure its store network with the closure of its physical Furniture Barn units.